Charlie is very hungry and has started tucking into his dinner. Can you guess what he's eating? Follow the lines to find the letter that goes in each box. When you've finished you'll be able to see just what Charlie's favourite dinner is. Pablo the dog wants to eat Charlie's dinner - it's his favourite too! Watch out Charlie! Which vegetables is Charlie having with his dinner? Do you like vegetables? Have a think about the foods you like best of all - why not draw a picture of your favourite meal on the back of this puzzle? Don't forget the vegetables! 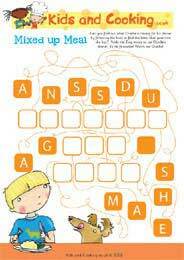 Why not Download the Mixed Up Meal Puzzle right now and see if you can find out what's on Charlie's plate. This activity is aimed at 4 to 7 year olds, it's a fun way to help children learn a little something about food and cooking, as well as building their creative and recognition skills.